Dennis Wayne Woughter, age 75, passed away on Tuesday, April 17, 2018 at his home in West Branch, MI. He was born on January 28, 1943 in West Branch to Victor and Erma (Harris) Woughter. Denny married Jolene Austin in Flint on June 16, 1979. He enlisted in the Army and served in Germany from 1961-1964. When he returned home from the service, Denny worked in Flint for General Motors as a fork truck driver and after retiring from General Motors, he moved back to West Branch. He was a member of the St. John Lutheran Church in West Branch and the American Legion Post #0103. Denny grew up in church, where he was baptized and confirmed. He was a history buff and enjoyed snowmobiling, canoeing, camping, and loved spending time with his family. Denny is survived by his loving wife of 38 years, Jolene Woughter of West Branch; children, Brenda (Mark) Blanchard of San Antonio, TX, Aric (Kerrey) Woughter of Traverse City, MI, Jamie (Sarah) Woughter of Flint, MI, Jodi (Joseph) Doherty of Flint, MI, and Nicholas Woughter of Davison, MI; 13 grandchildren, 2 great grandchildren; and brothers, Larry (Mary) Woughter of Flint, MI, Daniel (Judy) Woughter of Harrison, TN, James Woughter of West Branch, and Mark Woughter. He is preceded in death by his parents and brother, Jerry. Emery Egan, Class of 1961 West Branch High School, was born on January 12, 1942 and passed away on Tuesday, February 21, 2017. Emery was a resident of Bay City, Michigan at the time of his passing. He was married to Laura. Funeral services will be on Friday February 24, 2017 at Bible Baptist Church in Pinconning at 11 am with Pastor Jeff Link presiding.SERVICE Friday 24 Feb 11:00 AM - 11:00 AM Bible Baptist 300 South Arthur St Pinconning, Michigan 48650. The family is requesting for no flowers to be sent to church. Ronald Lee Keith, age 74, passed away on Thursday, April 27, 2017 at his home in West Branch, MI with his family by his side. Ron was born to Ben and Henrietta (Hartman) Keith on November 4, 1942. He lived in West Branch for his whole life. In 1963, he joined the Navy. Upon his returning home, he worked for his parents at the family business, The West Branch Greenhouse. On April 20, 1968 he married the love of his life, Shelda “Jeanie” Robinson. They spend 49 wonderful years together. In 1975, Ron and his brother Wayne bought the family business. Ron, Jeanie, Wayne and Kathy worked the business until 1995. Ron then went on to sell Real Estate for Dunbar-Bell. In 1997, he started driving school bus for the West Branch Rose City Schools until he was forced to retire due to a medical reason in 2012. Ron is survived by his wife, Jeanie; son, Ronald II; brother, Wayne (Kathy) Keith all of West Branch; sisters in law, Sheila “Tootie” Webber of West Branch, Sharon “Miki” Curfman and Kenny Faiver of Lansing, MI; brother in law, David “Butch” (Mary) Robinson of West Branch; nieces and nephews, Karrie, Ketha, Karla, Kelly, Kirsten, Kimberlee, Ben, Sheila, Jami, Kristina, Vicki and their families; and sister in heart, Pat Sweet. He is preceded in death by his, son, Douglas Benjamin Keith, parents, Ben and Henrietta Keith, and in laws, Doug & Shirley Robinson. Ralph Allen Graham, Jr. age 72, passed away January 10, 2016 at the Villa at Rose City. Ralph was born in Bay City to Ralph and Cecelia Graham on July 26, 1943. His family moved to Selkirk in 1949 where he attended the one-room Red School and later the West Branch High School; graduating from Bay City Handy in 1961. Ralph joined the Michigan State Police in 1968 and served posts in Battle Creek, Lapeer and Manistique; retiring from the West Branch post in 1993. Upon retirement, Ralph obtained his private pilot’s license and loved to fly his 182 Cessna with friend Monty Antcliff. Ralph purchased a horse farm in 1986 where he bred and raced standardbred horses, driving more than just a few into the winner’s circle. Ralph enjoyed golfing with his partner, Larry Boncher, and also loved to hunt especially with his friends at Tamarack Camp. He was a guide at Paradice Hunt Club for about 4 years. He was also an avid fisherman. Ralph’s favorite vacation spot was his deer camp in the Upper Peninsula which he shared with his son. Many late nights were spent there trying to euchre the wives just one more time. Ralph is survived by his wife, Linda; son, Allen (Sheri) of Bessemer, MI; daughter, Gina of Sanford, NC; grandchildren Catherine Brody and family of Lehigh Acres, Fl; Jessica Graham of Eugene, OR; Todd Cardoza (Jessica) and family of East Jordan,MI; Justin Graham of Burlington, VE; and Christopher Morris of Beulah, MI. He also leaves eight great grandchildren. He is also survived by sisters Nancy Francisco of Boyton Beach, FL; Geraldine Schorn of Grand Rapids,MI, half-sister, Kathy (Ben) D’Arcy of West Branch, MI, half-brother Tim (Sonja) McPeck; sister-in-law, Kathy Layman and brother-in-law, Paul Layman all of Fairview, MI. He leaves many nieces and nephews who will greatly miss “Uncle Sonny”. He also leaves his beloved dog, Missy. Ralph was a member of Trinity United Methodist Church and enjoyed the old fashioned hymns. He was preceded in death by his parents, brother-in-law, Jim Francisco, sister-in-law, Karen Grant, in-laws, Ernest & Martha Layman; nephew, Michael Grover and several aunts and uncles. Rodger was born on April 16, 1943 and passed away on Saturday, March 8, 2014. 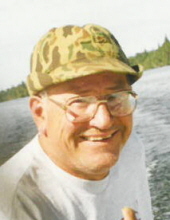 Rodger was a resident of North Branch, Michigan at the time of his passing. Phyllis Ann Ostrander, age 71, passed away on Thursday, September 11, 2014 at her home with her loving family by her side. Phyllis has lived in West Branch for her entire life. She was born to Russell and Theresa “Irene” (Green) Schmitt in West Branch, MI on March 30, 1943. Phyllis loved spending time with her family and friends and was known by many people as “Aunt Philly”. Phyllis is survived by her husband, Dallas Ostrander of West Branch; daughter: Susie (Chuck) Hammontre of West Branch; son: Danny (Allison) Ostrander of West Branch; grandchildren: Jordyn, Justin, Caleb, and Dylan; brothers: Thomas (Janet) Schmitt of West Branch and James (Diane) Schmitt of West Branch; brother in law: Edwin (Yvonne) Ostrander of West Branch; and many nieces and nephews. She is preceded in death by her parents. Visitation at the Steuernol & McLaren Funeral Home in West Branch will begin Sunday, September 14, 2014 from 2:00 p.m. to 9:00 p.m. with a Scripture Service at 7:00 p.m. On Monday, September 15, 2014, Phyllis will lie in state at the St. Joseph Catholic Church beginning at 10:00 a.m. until the Celebration of Life Mass at 11:00 a.m. Father Patrick Maher will officiate. Burial will follow at the St. Joseph Catholic Cemetery. 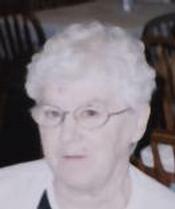 Shirley Schubert Rau, age 79 of West Branch passed away Tuesday July 19, 2011 with her family by her side. Shirley was born in West Branch on June 29, 1932 to Russell and Gertrude Schubert. She married Gerald Rau on June 16, 1951. Gerald and Shirley farmed in Edwards Township until 1987 with their two daughters and son. Shirley enjoyed her grandchildren, playing cards with her friends, going to the casino, and watching Wheel of Fortune. She baked chocolate chip cookies for her grandkids which they loved. Shirley is survived by her daughters, Julie Rau of Ithaca and Jeri (Sam) Orlando of West Branch. She is also survived by her grandchildren Shannon Orlando, Samuel Orlando, Rebecca Rau and Emily Rau. Also surviving is her sister, Marilyn (Tom) Bydalek, brothers, Dean (Shirley) Schubert and Ron (Nancy) Schubert, sisters in law Maxine (Adrian) Dantzer and Kathleen (Bernard) Groulx and her brother in law Robert (Lyla) Rau. Shirley is also survived by many nieces and nephews who spent time with Shirley and Gerald at the farm. Also her grand-dog Rusty. The Rev. Elwyn Slider Steuernol, pastor of St. Agatha Catholic Church in Southeast Portland for nine years, collapsed and died Tuesday during a priests' retreat at Mount Angel Abbey. He was 66. Steuernol, the only married priest to serve in the Archdiocese of Portland, had been a Presbyterian pastor since 1975 and had served Smith Memorial Presbyterian Church in Fairview from 1981-94. He was ordained in the Catholic Church on Nov. 30, 1996, in St. Mary's Cathedral in Northwest Portland, in the presence of his wife and children. His ordination sparked some controversy among the Catholics he was joining and the Presbyterians he was leaving. Some Catholics argued that priests should be unmarried and celibate, while others wanted to open the priesthood to more married men and to women. Some Presbyterians saw Steuernol's conversion as a sign of growth and change in his human spirit, but others said he didn't know what he was getting into. In a 1996 interview, Steuernol said he had visited Our Lady of Guadalupe, the Trappist abbey in Lafayette several times, looking for a "supernatural thing in worship." "As Protestants, we tend to be rational in our worship," he told The Oregonian. "As a pastor, I got tired of feeling like the success of worship was based on how well I preached." Steuernol said he found what he was looking for in the Mass, in which Catholics believe bread and wine become the body of Christ. "The Eucharist is like an altar call," Steuernol said. "You go forward and offer yourself as a living sacrifice." Steuernol announced his conversion publicly in 1993. Cardinal William J. Levada, archbishop of Portland from 1986-95, helped Steuernol receive permission from the late Pope John Paul II to be ordained in the Catholic Church. At the time, the archdiocese expected Steuernol to serve only as an assistant pastor, said Bud Bunce, spokesman for the archdiocese. But a shortage of priests led to him functioning as pastor at St. Agatha's. "It's a very tight community down in Sellwood," says Pat Hainley, a lifelong member of the parish. Steuernol and his wife "fit in from Day One," he says. "I'm sure there was a little skepticism: A married priest -- what is that all about? But he overcame whatever reservations people had. He was that kind of person." Steuernol was born on July 17, 1943, in New Martinsville, W. Va., to Wynne J. and Imogene E. Slider Steuernol. He attended the University of Michigan from 1961-63. He later said that he became a Christian while at Michigan. He graduated from Wheaton College in Illinois in 1965. He lived in England for three years, evangelizing university students. He met his wife, Jacqueline, who is English, in France in 1968 and they married in 1969. He attended Princeton Theological Seminary and graduated with a Master of Divinity in 1973. After his conversion, he attended Mount Angel Seminary and graduated with another master's in 1997. He was a deacon at St. Henry Catholic Church in Gresham in 1996 and appointed to St. Agatha's in 2001. Steuernol collapsed about 2:30 p.m. Tuesday as he played racquetball during a recreation break at the priests' retreat. No one on the scene was able to revive him, said Nick Scovill of Raleigh Hills, who has been married to Steuernol's sister, Jane, for 40 years. Scovill said he had seen his brother-in-law a week ago and he seemed to be in good health. "We're all still in shock," Scovill said. Steuernol is survived by his mother; sister; his wife; three children, Ashli of Damascus, Kristi of Redwood Valley, Calif., and Tim of Los Angeles; and six grandchildren. Vigil will be at 7 p.m. Tuesday at St. Agatha's, 7983 S.E. 15th Ave. Mass of Christian burial will be at 11 a.m. Wednesday at St. Mary's Cathedral, Northwest 18th Avenue and Couch Street. Burial arrangements, which will be at a Portland Catholic cemetery, are pending. Remembrances are suggested to the scholarship fund at St. Agatha Catholic School, 7960 S.E. 15th Ave., Portland, OR 97202. Wilhelm's Portland Memorial Funeral Home is in charge of arrangements. 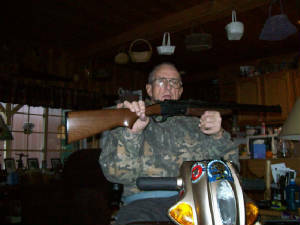 Don Beck, class of 1961, shares a passion of his in rebuilding guns. AFTER GRADUATING IN 61 I WORKED FOR VERN WANGLER FOR SUMMER OF 61 THEN WORKED THE WINTER FOR THE GALLAGHER FARM . SUMMER OF 62 WENT BACK TO WANGLERS . THAT FALL I MOVED TO FLINT MI. WORKED AS A RIVETER AND A TACK WELDER FOR A STEEL COMPANY . IN JUNE MARRIED A FARM GIRL FROM GLADWIN [LINDA FOOR] IT WILL BE OUR 52ND ANNIVERSARY JUNE 15 TH. IN 1986 THEY PUT ME OUT ON A DISABILITY FOR I GOT MUSCULAR DYSTROPHY AND I DID A LOT OF CLIMBING WHICH SOME TIMES WE WERE IN THE AIR QUITE HIGH . AT THIS TIME WE WERE LIVING IN LAPEER COUNTY. WE SOLD OUR HOUSE AND MOVED TO BEAVERTON, MI. BUILT A HOUSE AND LIVED THERE FROM 1986 TO 1996 . DAWN MARIE B 9-29-65 AND TWIN BOYS 7-9-69 .ONE WENT TO MICHIGAN TECH IN HOUGHTON ,MI. AND GOT A JOB IN FORESTRY AND EVENTUALLY WE ALL MOVED TO THE UP . WE LIVE BY EWEN AND BRUCE CROSSING. BEAUTIFUL COUNTRY . I HAVE HAD SEVERAL HOBBIES I WAS A FLAG FOOT BALL COACH FOR 2 YEARS AND LITTLE LEAGUE BASE BALL COACH IN LAPEER COUNTY-BOW HUNTED-DEER AND BEAR HUNTED-FISHED-ATV RIDING – HORSE BACK RIDING AND PLAYED HOCKEY. I AM IN A WHEEL CHAIR NOW SO MOST OF THOSE THINGS I CAN NO LONGER DO SO I HAVE TONED IT WAY DOWN. I STILL HUNT OUT OF OUR HUNTING CAMP ON OUR 40 ACRES – CROSSBOW HUNT A LITTLE. PLAY CARDS AND MY MAIN PASSION RE DOING SHOT GUNS AND RIFLES. I ALSO BELONG TO ONTONAGON SPORTS MAN CLUB WHICH I SHOOT IN COMPLETION ONCE A YEAR AND HAVE JOINED WHITE TAILS UNLIMITED PLUS I ENJOY MY LAP TOP . THE LORD HAS BLESSED US SEVERAL TIMES IN SPITE OF THE PASSING OF A GRAND CHILD , OUR OLDEST SON ,AND A GREAT GRAND CHILD. WE ALL HAVE TRAGEDIES IN OUR LIFE BUT FAITH IN THE LORD KEEPS US GOING. IT HAS BEEN A LONG ROAD SINCE WEST BRANCH .